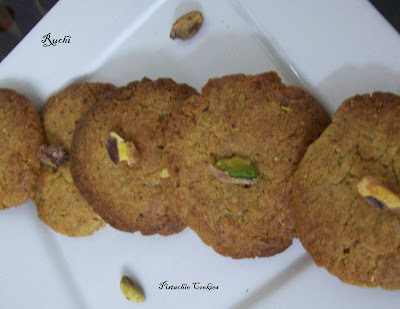 These pistachio nut biscuits are easy to make, This cookie tasted great; very nice indeed.. They melt in your mouth like mmm.. What to say? The cookies were divine. 1.Grind the 1/2 cup nuts using a blender into a course powder.Now take your handful of pistachio nuts and coarsely grind them, put these to the side in a separate dish. 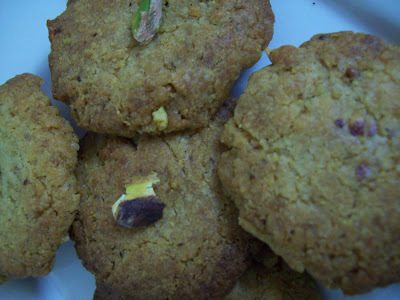 2.In a medium bowl, whisk together flour, baking powder and ground pistachios until thoroughly incorporated. 3.In a large mixing bowl, cream together butter and sugar until light and fluffy. Add vanilla beating until completely combined. 4.Add the dry ingredients and mix just until combined.Fold through until it forms a stiff dough. 5. Preheat oven to 180 deg C. Bake until lightly golden and just lightly browned around the edges, about 12-15 minutes. 6.Remove and place on a wire rack to cool completely. 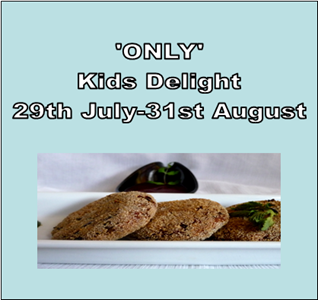 I am sending this recipe tp Pari's Kids Delight Event.